A full service ski touring center located on over 1100 scenic acres of varied terrain along the Montreal River in Ironwood Michigan. We will be opening Friday with early season conditions. We will not be setting tracks on Friday but maybe on Saturday weather permitting. We rolled about 30 km of trail this morning. The base is thin and has some wet spots. The trail is freezing down well tonight as the temps are in the teens. We do not recommend your best skis. It’s looking like winter again! We have been getting a dense base building snow off and on today and it continues to snow as I type. 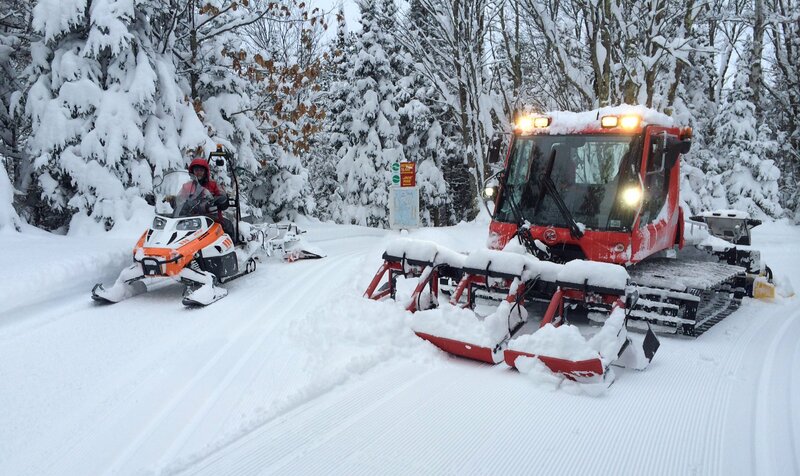 We plan to groom in the morning and let it freeze Thursday, opening the trails Friday. This is the plan, it could change based on weather. 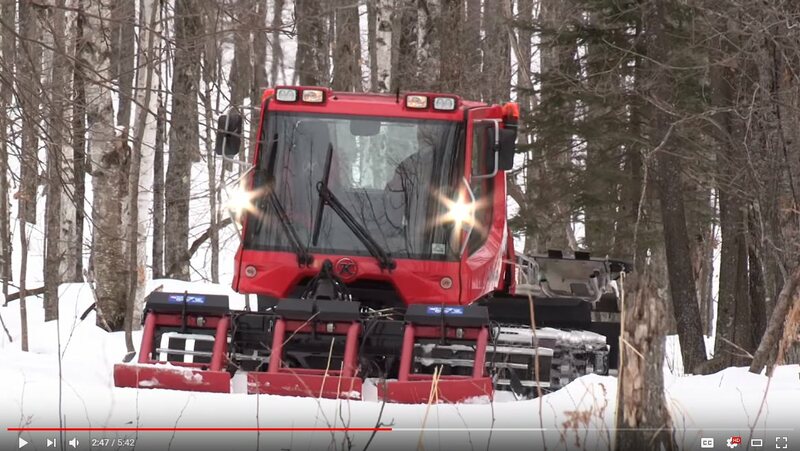 I am not sure how many km will be open, how many tracks set if any, and how thick the base will be. What I can say is we will do the best we can with what we have to work with. 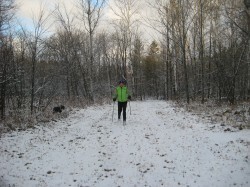 Angela went out today for a ski with Spanky on the Dog Trails. Enough snow to glide but more is needed to groom and open. 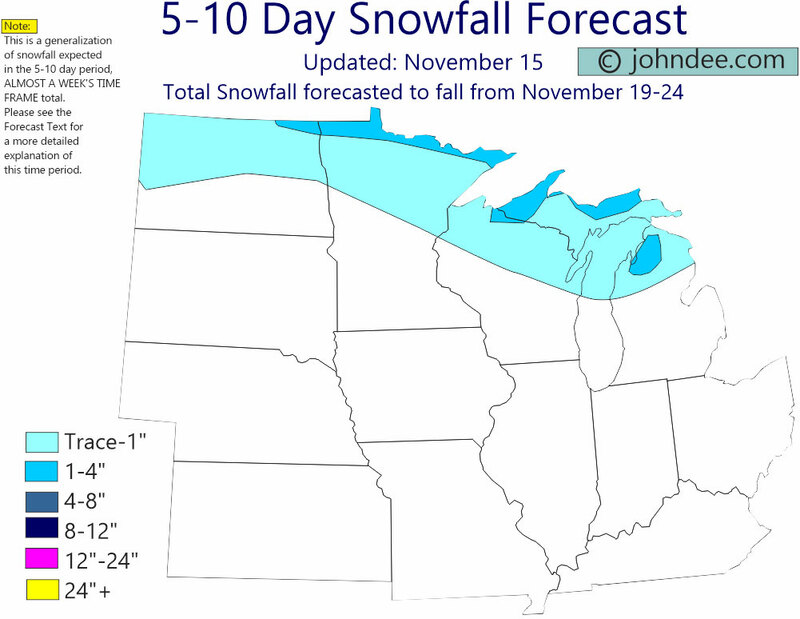 It looks like John Dee is calling for significant snow this week. We have not received any snow yet, and are not open for skiing. It looks like we have a chance of getting going this weekend Friday/Saturday but this is just based on the forecast. We will keep you posted now on a daily basis as the weather changes. The Ski Shop will continue its sale this Friday and Saturday from 9-4. ABR will be opening its ski shop this Saturday from 9-4 CST. All non sale merchandise will be 10% off. Sale prices are in bold, otherwise take 10% off listed prices. Here is our current equipment list. For updated conditions via email, Join our mailing list!